Weight* 5 lb. 10 oz. Preparing for the upcoming Ordnance Technical Committee approval of the Carbine, Caliber .30, Model M3, instructions for the preparation of drawings and specifications appear in an Ordnance document dated 4 Aug 1945. These include the following. On 16 Aug 1945 the Ordnance Technical Committee followed the recommendations of the Ordnance Sub-Committee on Small Arms. The Carbine Caliber .30 M2, modified to include the stock and receiver design of the Carbine Caliber .30, T3, complete with T23 Flash Hider, was designated as the Carbine, Caliber .30, M3. [Ordnance Technical Committee Minutes Item #28782 dated 16 Aug 1945]. The approval neglected to include the use of the M2 stock instead of the T3 stock. This omission was corrected after the end of the war and is discussed further below. Japan had announced their surrender the day before the M3 carbine was adopted. On 02 Sep 1945 Japan signed the articles of surrender followed the next day by the cancellation of all weapon contracts by U.S. Army Ordnance. Markings "U.S. Carbine, Cal .30, M3"
A constant theme with everything related to the infrared sniperscopes was they were on a fast track that often preempted normal testing, logistics, etc. Winchester was manufacturing T3 carbines from their first contract when Japan signed the articles of surrender on 02 Sep 1945. On 03 Sep 1945 Springfield Ordnance District canceled all of Winchester's ordnance contracts ending all production. These were to be the 15,000 M3 carbines referred to in the "Drawings and Specifications for 15,000 Carbine, Cal 30, M3" dated 4 Aug 1945. Of the 5000 T3 carbines contracted under Winchester's first T3 contract they had completed only 1,108 when Springfield Ordnance District canceled the contract. Winchester's final shipment to ordnance of the T3 carbines they had completed was on 7 Sep 1945. Three weeks later on 28 Sep 1945 Winchester was awarded a contract to change 1,108 T3 carbines to M3 carbines at a cost of $15.00 each [Winchester contract documents, McCracken Library, Cody, WY]. Springfield Armory responded to the request 15 Dec 1945 requesting information on the scope to assist in preparing the drawings. The Chief of Ordnance responded 5 Jan 1946 the M3 carbine is a weapon without scope or equipment pertaining to it and is a component part of the Sniperscope M2. He indicated that not even an outline of the scope should be included as the Sniperscope M2 was classified "confidential" and the M3 carbine was unclassified. To assist Springfield Armory he included a copy of document 474.5/319 dated 11 Apr 1946 "Drawings and Specifications for 15,000 Carbine, Cal. .30, M3" as detailed in the chart above on this page. On 11 Apr 1946 Springfield Armory provided the Chief of ordnance with documents he had requested for the M3 carbine. Unfortunately these documents were not attached as indicated when the records were photographed at the National Archives in preparation for this website. from the Dept. of Defense this drawing was among them. It's not known why this drawing was originated in 1950. Note the presence of the selector switch for changing from semi-automatic to full automatic fire. So What Happened to all the M3 Carbines? What follows is significant and important when reading an Army publication and/or manual related to any of the .30 caliber carbines. When the Ordnance Technical Committee standardized a carbine model the model number to be indicated on the receiver applied to the manufacturer(s) only. The model number was not altered on any carbines converted to a different model. Ordnance and the U.S. military did not identify a carbine by the model number on the receiver. They identified the carbine model based on the characteristics of the carbine. For example we'll use the Carbine, Caliber .30, Model M2. At the time the Ordnance Technical Committee approved the Model M2 carbine 14 Sep 1944 (item #25106). They also directed all existing M1 carbines should be equipped with a select fire kit when the opportunity to do so presented itself. Ordnance also indicated the model number on carbines to which the select fire kit was added was not to be changed or altered. 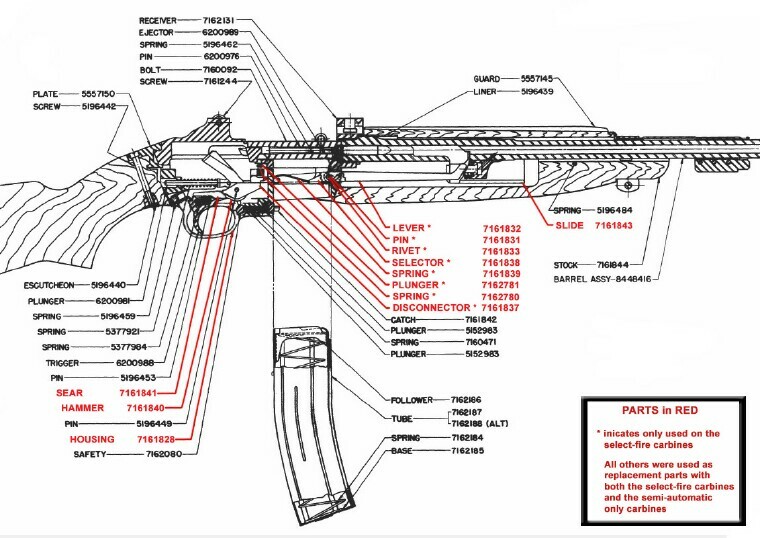 Carbines having the select fire kit were deemed Model M2 carbines based on the presence of the kit regardless of the model number indicated on the receiver. Likewise when a carbine did not have the select-fire kit it was deemed an M1 carbine regardless of the marking on the receiver. When the Winchester contract for what was to become the Carbine, Caliber .30, Model M3 was canceled and no manufacturer was subsequently contracted to manufacture the M3 carbine the M3 marking was never used. Instead of renewing Winchester's contract to manufacture the M3 carbines on 28 Sep 1945 Winchester was awarded a new contract to change 1,108 T3 carbines to M3 carbines at a cost of $15.00 each. The T3 marking on the receivers of these carbines was not changed or altered. If a T3 carbine had a select-fire kit it was an M3 carbine. Absent the select-fire kit it was a T3 carbine. To Ordnance and the Army the configuration of the carbine dictated which model number it was. In keeping with this protocol Ordnance manuals and other military documents referred to the carbine model numbers assigned to the particular configuration. A good example is SA-ITM-S201 Ordnance Inspector Training Manual, Carbines, Cal .30, M2 And M3 dated 1 June 1951. It's discussion of the development of the Model M2 and Model M3 carbines is based on the particular configuration and intended use. The manual goes into great detail as one would expect with an inspector training manual. Nowhere does it indicate which model number should be on the receivers or verifying the parts match up with the model number on the receiver. So the Carbine, Caliber .30, Model M3 existed but none had the M3 model designation on their receivers. Use of the model number alone to determine if a firearm is a machine gun was created by ATF in their interpretation of the 1968 Gun Control Act. Since then we have become accustomed to the model number designating the firearm. While this is true for some firearms, in the case of the .30 caliber carbines the firearm designated the model number. Select-fire or semi-automatic fire did not require a new receiver, new carbine design or any alteration to an existing carbine. It was as simple as field disassembly and including the select-fire kit during reassembly. Absent the select-fire kit the .30 caliber carbines with receivers having the M2 marking were legal to own from 1945 until ATF's interpretation of the 1968 Gun Control Act. Unregistered full automatic fire weapons termed machine guns were illegal well before WWII. The wording of the definition of a machine gun in the current U.S. Code is the wording in the 1968 Gun Control Act with the second paragraph amended by the 1986 Firearm Owner's Protection Act. Both were very specific that their intent was not to make legal firearms illegal. Their wording clearly indicates a machine gun is defined by its ability to fire multiple shots with a single pull of the trigger. This topic will be discussed in a bit more detail on the page devoted to the M2 carbines.